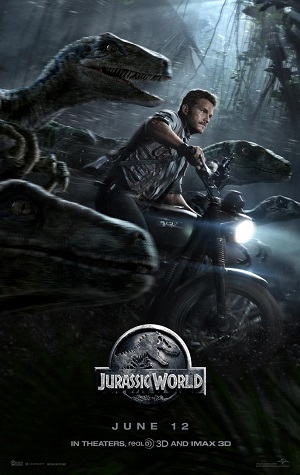 Jurassic World was not too extravagant as what I have expected, but it was definitely very entertaining. The film is the fourth in the Jurassic Park movie series and if you’ll consider the plot line during the last parts of the movie plus the behemoth amount of money it has earned, sequels are sure to come for the years to come. I have only seen the original Jurassic Park film and I must say it’s all fine because Jurassic World could stand on its own. I love Bryce Dallas Howard. After seeing her on the vampire series True Blood, I’ve always been looking forward to her performances. In the film, she has this charm that gets into you even though her character isn’t that much likeable at first. And the way she delivers her lines? It’s so great I won’t mind if she’s part of any ensemble of a film that I will be watching in the future. Chris Pratt, who’s fresh from a great 2014 thanks to blockbuster movies The Lego Movie and Guardians of the Galaxy, commands with his effusing charm and impossible likeability. This movie is a testament again that he can top bill a movie and people are going to watch. The supporting actors are very effective in their roles. Even though their characters have their own stories that considerably made the plot messier, they’ve had their own moments that make each one of them interesting. Speaking of messy plot, the movie presents the promising story of the return of a one-of-a-kind theme park in the world: the Jurassic Park, which is now called the Jurassic World. It features various attractions that involve dinosaurs of all sorts: from the ferocious Velociraptors, the mighty Tyrannosaurus Rex, the horrifying sea creature Mosasaurus and even their gentler kind such as Brontosaurus, Triceratops and a lot more. New additions are also added to the theme park: dinosaurs that have been genetically modified such as the shockingly tough Indominus Rex. Indominus Rex is a hybrid of T-Rex, Velociraptor and other dinosaurs, plus animals such as cuttlefish and tree frogs, which made it capable of various innate abilities of those animals such as thermal adaptability and camouflage. Imagine a dinosaur with these abilities and you’d never want to go near one! Anyway, what made up for the lack of in the story are the dazzling visuals and the non-stop action. These are the reasons watching the movie on IMAX make it worth it! I was happy the whole time I was there looking at the dinosaurs as they came alive! The terrifying ones were made so much more terrifying, the action sequences more appealing and the suspense much higher because of the 3D on the big screen! Jurassic World is a bit predictable but this cannot deny the fact that it’s definitely awesome. Count me in to watch its sequels!